Happy New Year to all you guys! May the New Year be a wonderful year for gaming! 2013 has been really awesome and it's my first full calendar year writing this blog. Made a lot of new gaming and collector friends, played lots of games and hoarded plenty of awesome collectibles. Managed to attend several gaming events as well! Also 2013 has allowed me to venture into other platforms apart from my PS3. Got a PS Vita from my wife as a birthday present, checked out several iOS games and games like Diablo 3 and Marvel Heroes have brought me back to PC gaming. Hopefully 2014 will bring more of the same. There will be several new changes to my life so hopefully will still find enough time to blog and play games as much as possible! Might also have to cut down a little on the expenses with collectibles but if things go according to plan, there will still be plenty of awesomeness in 2014. We will see how it goes. Do wish me all the best! Happy New Year once again from all the Assassins! I wish all of you the best for 2014 and I thank you guys for continuing to read my frequent rambling once again. I hope to continue amusing you in the coming year! Cheers! Googled the collections and came across your blog. Nice collection man, very nice. 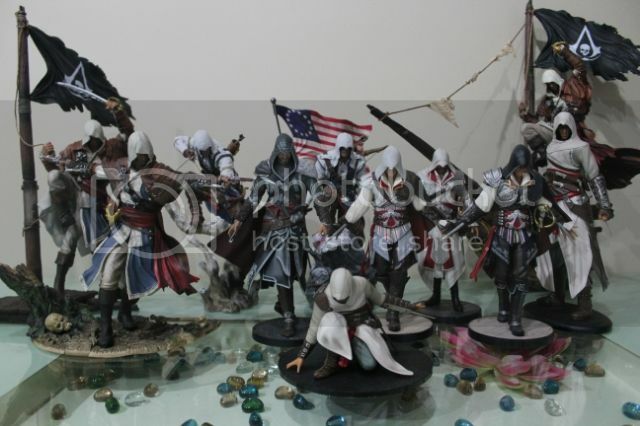 Would be great to own a crouching altair. I've got guillotine, notre dame, Arno the fearless and legendary altair pre-ordered. Really can't wait for legendary altair. What do you think of my collection so far? Hey Gouldylocks, thanks for visiting! Glad you like the blog and hope to see you visit again! I will regularly post updates on new AC stuff that are coming out. You got a pretty good collection going there, bet you can't wait for the rest of the ones coming later this year. Arno looks pretty good but my favourite is the Legendary Altair.